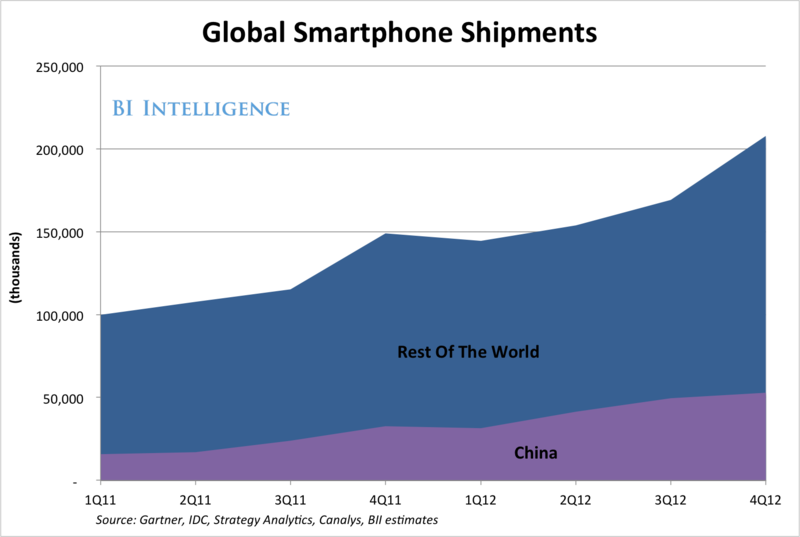 The red-hot Chinese smartphone market, the world’s largest by shipments and installed base, shows no signs of slowing down. According to Strategy Analytics, Chinese smartphone shipments hit 53 million in the fourth quarter, a 62 per cent increase from the same quarter a year prior. With global shipments of 207 million, China accounted for 26 per cent of all smartphones shipped globally in the fourth quarter. For 2012, Chinese smartphone shipments were an estimated 175 million, a 96 per cent increase from 2011. China also accounted for 26 per cent of annual shipments globally in the year, up from 19 per cent a a year ago— in a market that grew 43 per cent year-over-year. Android is reportedly dominant, accounting for 86 per cent of shipments, according to Strategy Analytics. Others have put Android’s share even higher. China is emblematic of the next wave smartphone adoption: large population, relatively low smartphone penetration, but less wealthy consumers. That means Apple will likely have to consider a less expensive handset to crack the Chinese market. 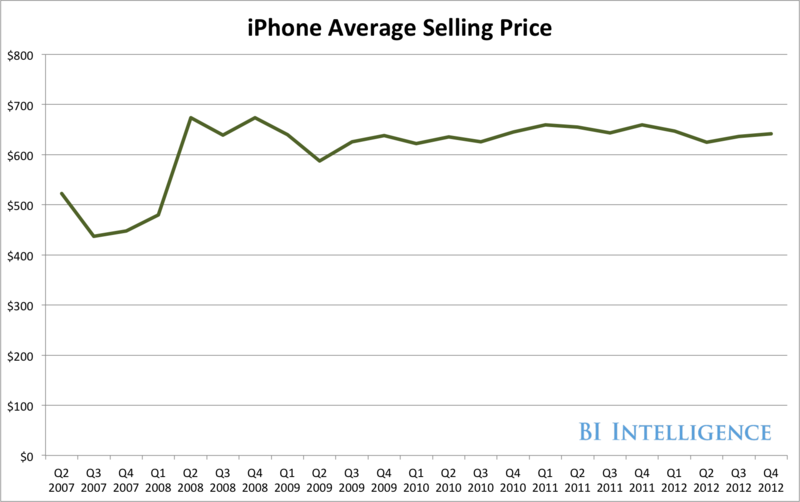 The average selling price of iPhones has been basically unchanged since mid-2008, despite broader price disruption in the smartphone market. In fact, given the current emerging markets-tilt to smartphone adoption, it seems possible that Apple’s market share has peaked— unless it moves ahead with a rumoured plan to release a cheaper, stripped-down iPhone.